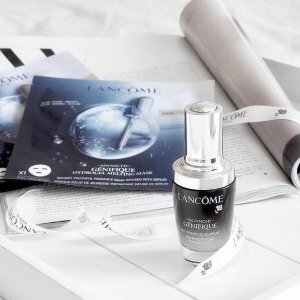 Lancôme offers 20% off with any $49+ Advanced Génifique Youth Activating Serum purchase via coupon code LANCOME20 . Or，up to $268 valued gifts with any $120+ Advanced Génifique Youth Activating Serum purchase. Receive 7-pc gifts with any $60 purchase ($126 value). Plus, receive an extra 3-pc gifts with any $95 purchase ($77 value). Plus, choose a full size energie de vie product (up to $42 value) and a Click & Glow highlighting skin fluid ($23 value) with any $120 purchase.